No 14 may be back in the valley today, as he was in Lincolnshire yesterday evening! Keep a look out. More info on his journey later. 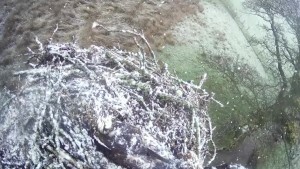 Our WEBCAM is up and running with live streamed pictures of the nest. Have a look now there is infra-red too. Left click play arrow and Unring’s your uncle and KL’s your aunt! 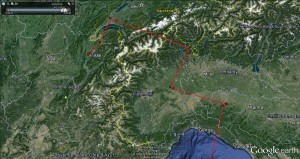 14 makes his way slightly North and West towards Lyon, gastronomic capital of France. If human he would be sitting in a convivial bouchon eating esox quenelles with a glass of Beaujolais to hand.Or in osprey terms munching a machon of pike washed down with Adam’s Ale. With Friday’s weather looking to be a balmy 17C with a light Northerly wind it would seem the height of folly to be make the journey towards the wintery Lakes. BBC Weather for Keswick – Rain, sleet and snow will come south-eastwards into the area later on Thursday lasting into Friday morning. 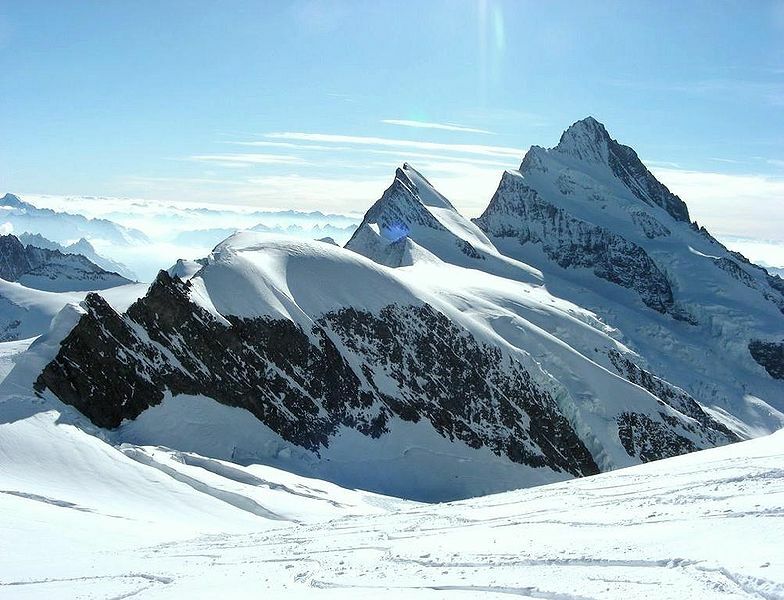 Accumulations of 5-10 cm are likely above 200-300 m with locally 2-4 cm to around 100 m.
For KL today this meant sitting on the nest with only her neck showing above a mound of snow. A day of such variable weather it made you proud to follow the British tradition and discuss it in depth. Bright clear warm Spring sunshine with a cloudless blue sky yet within 10 minutes overcast with a chill breeze and in another 10 minutes deep purple grey clouds and lashing sleet and frozen marbles of hail. Then sunshine again. For KL sitting on a nest exposed to every element there were some trying moments. As the first wave of sleet drummed down the valley in an opaque sheet she became noticeably agitated, ducking her head and staring towards the oncoming storm. The first mad maraca rattle hit her full in the face causing her to rear up off the eggs twisting her head, body and wings to avoid the painful percussions. If it had been possible it looked as if she would have wrapped her wings around her head, however with precious eggs to keep warm she subsided into the nest again and sat it out. Although the wintery showers are now dying away it won’t be too pleasant sitting through the night either, with a temperature of only 2C and stiff Northerly breeze. 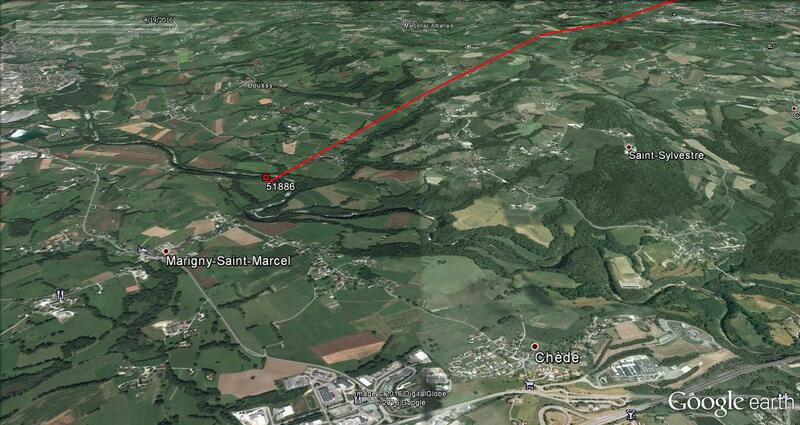 Her oldest son in Grenoble is also sitting it out at La Santon near Vif. The River Drac is providing him with his meals as it is particularly wide with occasional wider lake type sections There are no osprey breeding sites in this area of France so he’s having a holiday at present before deciding his next moves, or perhaps it is the same Northern air current holding him back although the night time temperature there is a couple of degrees warmer. 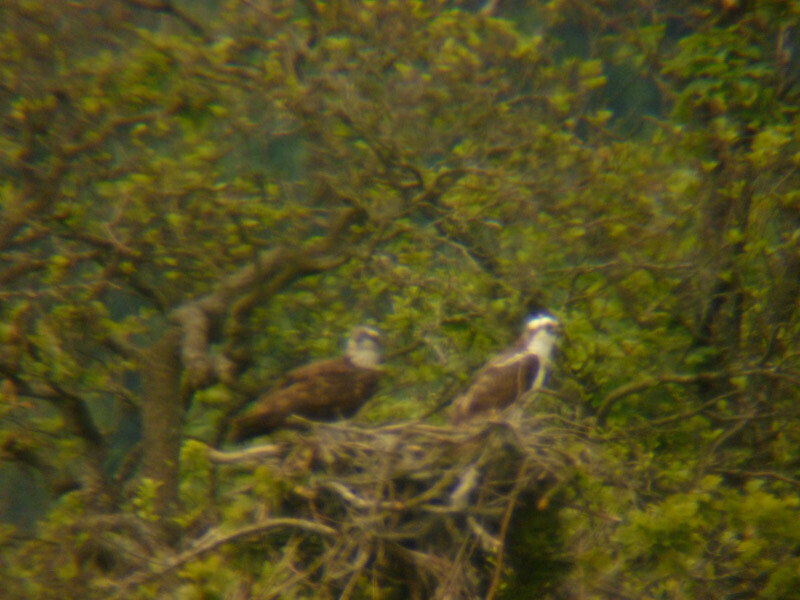 Derwent Water – our third bird spotted here with possibly a friend a couple of days ago! 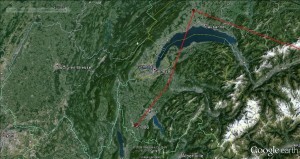 From Geneva our bets had been that 14 would have flown either West across France towards the UK or East back to his stamping grounds of last year on the German Czech border. But no he has surprised us all again by going to explore South! Grenoble is on an alluvial plain of the Isere and Drac rivers – so this photo is the kind of view a bird would see flying over. Gosh this is difficult keeping up with our No 14 bird. 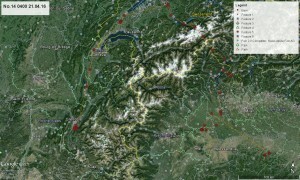 16th Sat night Valley of Po, in an area so wet it grows rice. The world is full of good news and bad news. The good news today is that on the night of the 17th No 14 roosted in the wooded hills to the east of Lake Maggiore and West of Lake Lugano in Northern Italy. More detail when the maps come through. Many of you will have heard the bad news broadcast by RSPB Bill Kenmir that the singular Golden Eagle of Haweswater has gone missing since storm Desmond and is now presumed to be dead. He gave so much pleasure to the many that watched him soar over the fells but for all that his was an unfulfilled life. He arrived 2001 to pair up with an old female. Not ringed, the youngest he could have been at that time was 3, and more likely, 5 years old. Thus he was probably between 19 and 22 years old at his death. His female disappeared in 2004 and was estimated to be about 27 years old. Sadly she had been too old to breed when he arrived so they had no young. The last chicks to be hatched in England were in 1996. Every year since her death he has displayed in the Spring skies above Haweswater watched through the RSPB telescope at weekends, everybody willing each season for this to be the ONE when he would attract a mate. It has not happened and now it is too late. The tragedy is not that this eagle has died – he lived to a good age- but that through constant persecution and our inability to share our world with other living creatures, it is unlikely there is any surplus young stock to replace him. Even if this could be reversed, with massive housing and industrial development already being implemented for the West coast our rural habitat is eroded. Golden Eagles need a large hunting territory and if in the future they cannot find it in Cumbria, long acknowledged to have the best biodiversity of all the counties of England, then they will find it nowhere. 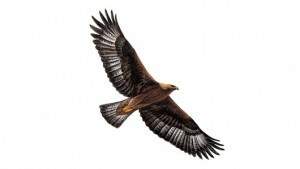 It is a bleak thought that we have seen the passing of the last golden eagle in England. Yes! A third egg for KL and Unring. This time not laid under the cover of darkness but was witnessed by both visitors and staff, arriving at 11.25 this morning. It was not perhaps the calmest of confinements as Unring insisted on being present at the ‘birth’. This is not something we have seen before as usually the female gets on with it by herself. KL was obviously in the throws of labour when Unring flew in, moved her off the eggs and sat there himself. 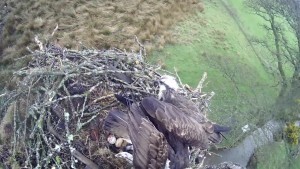 KL, pushed out to stand closer the nest edge, with her tail overhanging her spouse, did a sort of slow knees bend. When she stood up there was the egg. 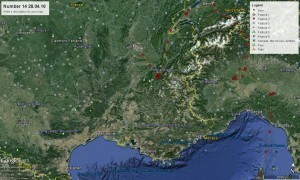 Again it was very beautifully marked with large red blotches. The pair soon swapped over again and she commenced brooding all three. Congratulations to John who had his finger on the recording button and managed to film the sequence. Just ask to see the clip when you visit Whinlatter CCTV screens. Three eggs is a full clutch, although occasionally some females will lay a fourth egg, or in exceptional circumstances a fifth or sixth, if the first ones are destroyed. However, often these are smaller and don’t hatch. Up until yesterday the pair were mating, indicating there was still another egg to come but we would expect them to stop as soon as the clutch is complete. Other sightings One of the Valley farmers had an interesting sighting of ospreys in the plural just before Easter, counting six in the trees along the marsh beck. This seems to back up our theory that the spell of fine weather a week before gave a window of opportunity for a lot of passage ospreys to arrive slightly earlier than average. They would all have been moving further North. It also shows that osprey numbers are steadily increasing. 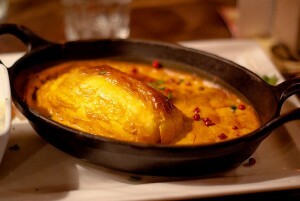 Roost in the Mediterranean? Of Corsican. 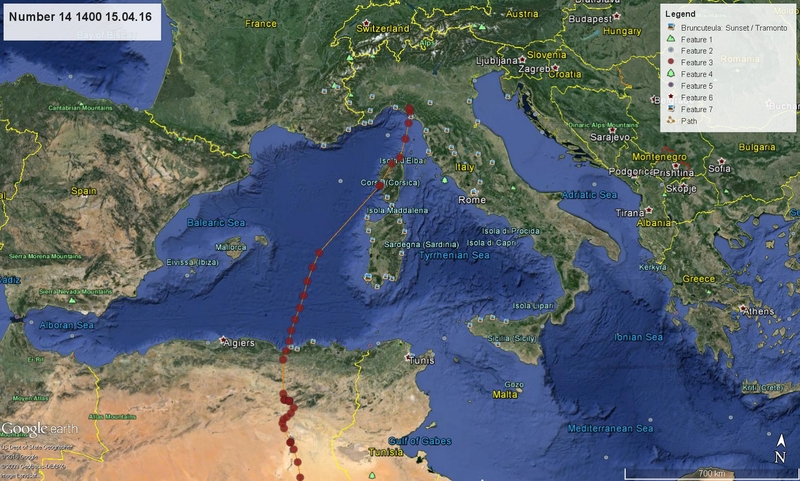 Regressing to fill in details the journey-line on the map for the 14th and 15th of April shows our bird in the Med has a great deal of sense. Rather than an all-in-one swoop across the 300miles of sea from the African coast he roosts on the Island of Corsica on the night of the 14th and moves onto Genoa on the 15th. 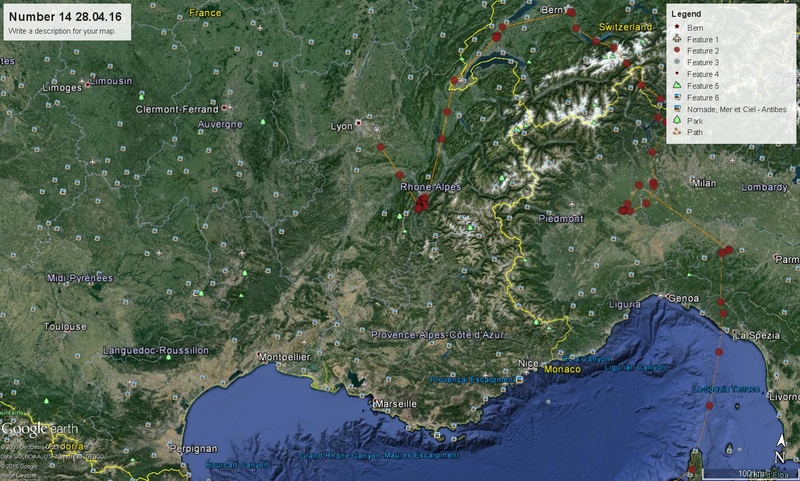 A third of the way across the Med he veers northwest to reach Corsica (not sure at this juncture if the line without dots represents some night flying) passing near the Sanguinary Islands ( Islands of Blood) towards Ajaccio. In the past a migrating osprey might have caught a fish in the Gravona River that flows through Ajaccio but now that river is nearly entirely consumed as the city’s water supply. 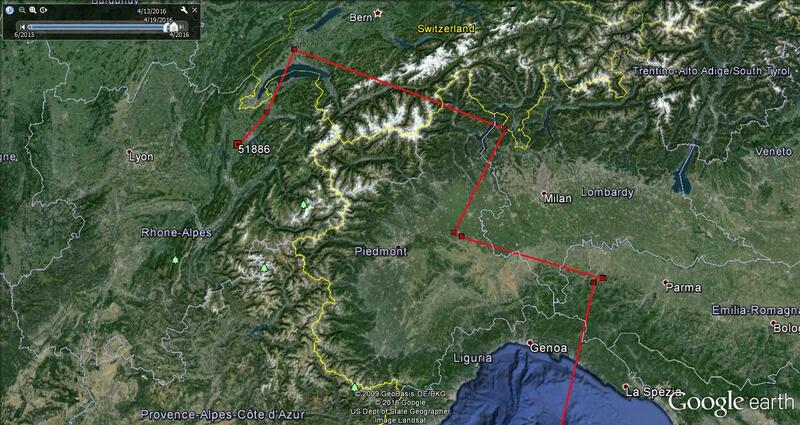 The last hop took him straight North to Italy, just East of Genoa. This is again another very significant place for marine wildlife as it houses a huge Aquarium whose mission is ‘to educate and raise public awareness as regards conservation, management and responsible use of aquatic environments.’ The magnificent biosphere, housing tropical plants, such as might grow in Bioko, was created by R Piano in 2001 – the first year that ospreys nested on Bassenthwaite. Well, our beautiful birds are now the proud parents of two eggs. As happens so often with these creative events, KL produced this one sometime in the night or early this morning. 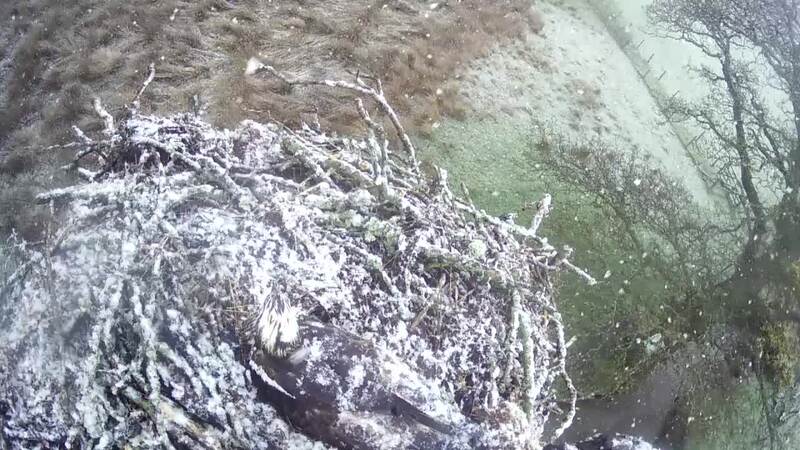 Here KL is getting off the nest so that Unring can have his turn at sitting.You can see which is the new egg on the left, as it is still is a bright pristine colour. The earlier one has regrettably taken on the khaki hue of the wet manure from the field that lines much of the nest. 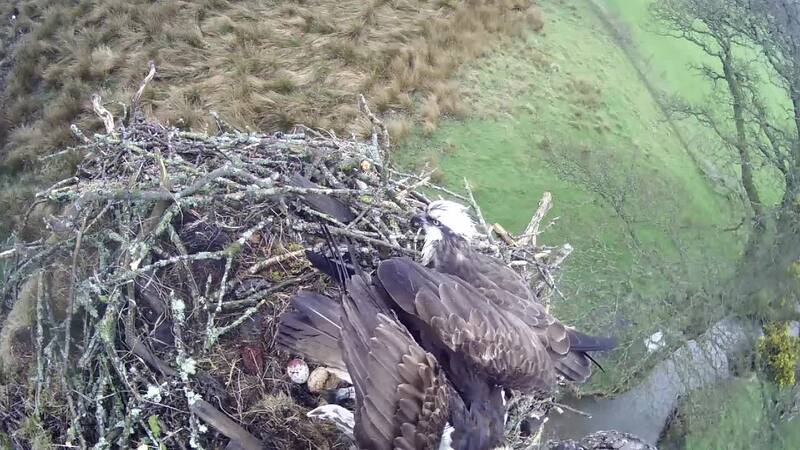 The incident with the black plastic seems to have been resolved with more nest material being plonked on top. Yesterday, it was a source of great consternation for both birds and watchers. In a series of constant rearrangements the egg found itself sitting on the plastic, rolling under the plastic, having the plastic pulled out from under it, and being wrapped up in the plastic.However, no harm done! No 14 speeds onwards. 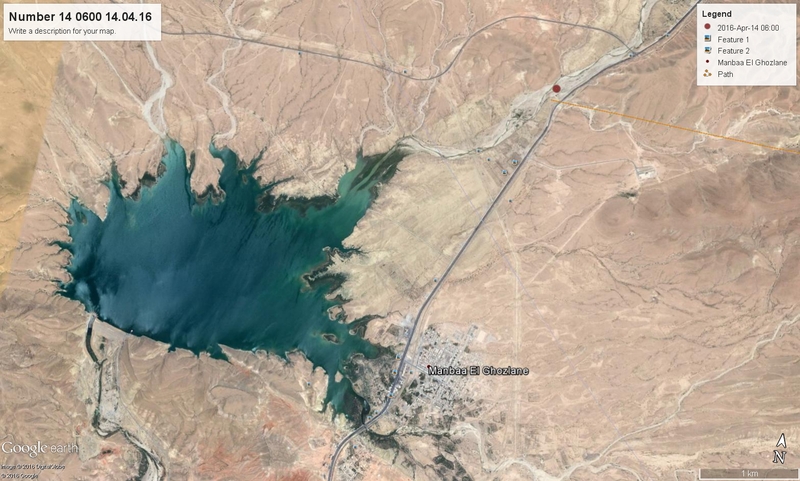 At 06.00hrs on Thursday 14th he reached the area of water we thought he was heading towards, a large reservoir with the dam at Manbaa El Ghozlane village named rather beautifully ‘Fontaine des Gazelles’, very lush and green. His tracker sign shows him over a dry river bed but probably there is some water in it at this time of year coming through from historic village and dramatic Gorges d’El Kantara. And with water comes fish. 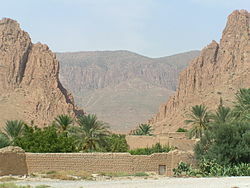 https://fr.wikipedia.org/wiki/El_Kantara_%28Biskra%29 With only one range of mountains between him and the coast he has crossed the major hurdle of the Sahara! 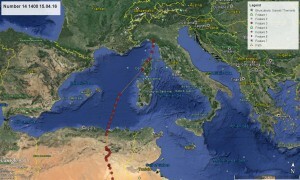 Today, Friday 15th he has forged on and crossed the Mediterranean in one swoop, landing in the afternoon SE of Genoa. He is such a strong bird! 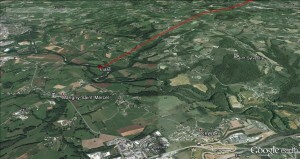 This is slightly West of his path last year, perhaps influenced by the south easterly breeze. With a clear sky tonight his bedtime temperature is a clement 15C although it looks to be slightly more overcast tomorrow.